President Obama's $447 billion jobs package appears to be headed nowhere fast in Congress, and Senate Republican Leader Mitch McConnell is suggesting that's exactly what the president wants. In a statement Tuesday, McConnell said the White House's "explicit strategy" is to "make people believe that Congress can't get anything done." "The political operators over at the White House seem to believe that they benefit from the appearance of gridlock," McConnell said. 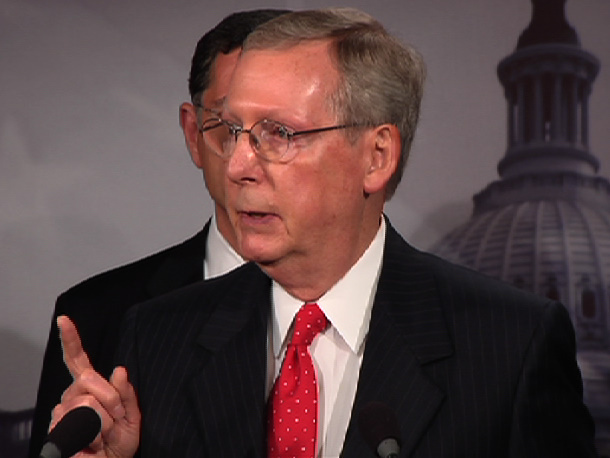 The GOP leader's statement came after Mr. Obama sent Congress three long-anticipated free trade agreements. McConnell said the administration's interest in gridlock explains both why it took so long to pass the trade agreements and also the status of the American Jobs Act. "How else do explain the fact that the president's spent the past few weeks running around the country demanding that Congress pass his so-called Jobs Bill 'right away' even as leading members of his own party admit that Democrats wouldn't have the votes to get it through Congress even if it came to the floor?" McConnell said. The trade agreements were finally sent to Congressafter they were stalled by disagreements over spending to assist American workers displaced by free trade. Meanwhile, the president has been busy promoting his jobs legislation -- which is mostly comprised of tax cuts for taxpayers and small businesses, and also includes investments in areas like infrastructure and unemployment benefits -- which he says is the quickest way to reboot the economy. In spite of Mr. Obama's strong push for the bill, Republican leaders in the House have essentially ruled out voting for the bill in its entirety. When asked on Monday if the president's jobs package was completely dead on arrival as one bill, House Majority Leader Eric Cantor said yes. Mr. Obama takes his push for the jobs bill to Dallas on Tuesday, and will challenge Republican leaders to put the whole bill up for a vote. According to excerpts of his remarks released by the White House, the president will say, "At least put this jobs bill up for a vote so that the entire country knows exactly where every Member of Congress stands." "I'd like Mr. Cantor to come down here to Dallas and explain what in this jobs bill he doesn't believe in," Mr. Obama will add. Yesterday, the White House said Mr. Obama would be willing to sign into law just parts of his jobs plan, but he's interested in seeing Congress pass the bill in its entirety. White House Press Secretary Jay Carney reiterated the president's argument that the bill is comprised of ideas that have gained bipartisan support in the past, so Congress should have no problem passing it. Furthermore, Carney said the public is behind the ideas in the bill. "The American people want action on the economy and jobs. They do not want political posturing," he said. As to whether Mr. Obama would campaign on the issue of Republican objections to his bill, Carney said he would -- and with good reason. "If you're saying that we have differences and the president believes strongly that we should take all of the action that is embodied within the American Jobs Act, and others -- perhaps Republicans on the Hill -- think otherwise, then sure, we should explain ourselves. They should explain themselves," he said. Carney added, however, that the White House would "much rather" just have Congress pass the bill "because it would be good for the economy and good for the American people... That is the highest priority." While Republicans have made clear they're not interested in passing the whole bill, Democrats have acknowledged their own party's problems with the bill also. Democratic Sen. Chuck Schumer on New York said Sunday that the main hang up is not the bill itself, but the president's plan to pay for it, the New York Daily News reports. "After [Obama] announced the jobs bill... he proposed ways of paying for it that are probably not the best way to garner the votes," Schumer said. "We're looking for better ways." The president's plan to pay for his bill relies mostly on collecting more taxes from corporations and the wealthy.